Posted on June 3, 2013 in Charities. The BisMan Bombshellz donated $200 to Burleigh County Bookmobile from the proceeds of their April 27, 2013 bout. 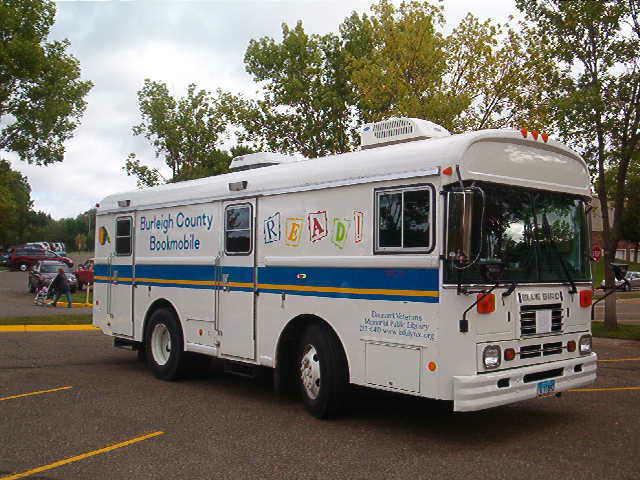 The Bookmobile has served the residents of Burleigh County since 1975. It has 9 different routes and operates on a monthly schedule. It makes regular stops at schools, towns, assisted living centers and various locations throughout the county. Bookmobile services are for everyone! If you see us parked, you can come on aboard, check out items, or apply for a library card (ID is required). You may request books from other public libraries in our consortium (CDLN) and pick them up on the bookmobile. You may return books from other public libraries to the bookmobile and we’ll get them back for you! The bookmobile averages 428.66 miles a month!